For 2016 legislative elections, DPP minority whip Ker Chien-Ming decided to return to Hsinchu to run for legislator, coming into conflict with the New Power Party candidate Chiu Hsien-Chih and his campaign team. As a result, Chiu Hsien-Chih’s campaign has been hotly discussed in the media as an occasion in which the Third Force runs up against the DPP. 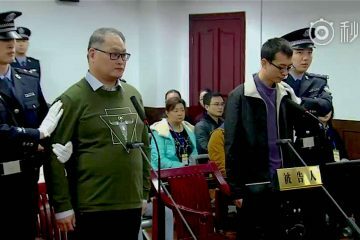 Through the Hung Chung-Chiu incident, plant closure worker layoffs, the Zheng Xingze mistrial and, the Sunflower Movement, Chiu has become known as a “free ace attorney.” From growing up at Fengchihu Lake in Chiayi, to being a Ph. 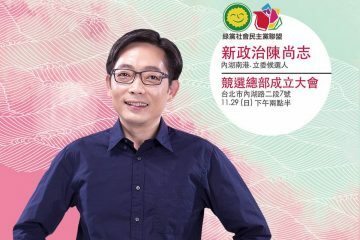 D candidate of the University of Heidelberg, he also served as the president of the Taiwan Association for Human Rights, providing pro bono services to the socially disadvantaged. So why would he become interested in entering politics? 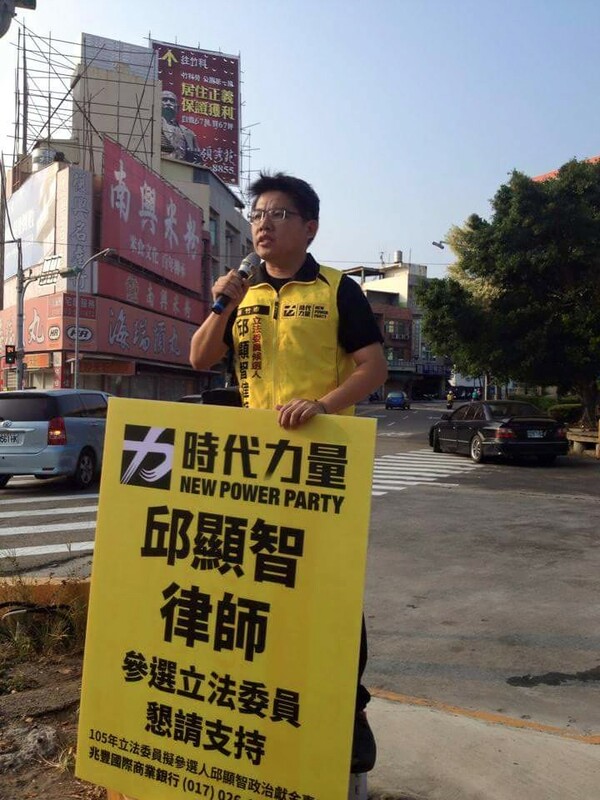 What can we look forward for him as legislator in Hsinchu? New Bloom interviewed Chiu alongside Chen Wei-Ting during their speaking tour of northeast America in late August. Edward Liu: Mr. Chiu, could you first tell us why you decided to run as a part of the New Power Party? Chiu Hsien-Chih: The reason is because after the Hung Chung-Chiu incidents, several NGOs that wished to become third parties. But at the time we were part of the Taiwan’s Citizen Union, in which many members were participants of social movements, lawyers, members of NGOs, teachers, and students. After the Sunflower Movement, we saw that there was an inherent problem of a lack of transparency in how the legislature functions , and there was room for improvement within the legislature. We felt that people needed to come together for legislative reform. So after the establishment of the New Power Party, we joined. We hoped that like-minded people could cooperate to solve the problem of chaos within the legislature. On the other hand, over the past three years, social movement participants have worked very hard under the oppression of the state. Concerning factory closures, the Hung incident, the opposition to windmills in the Miaoli county court, etc., the situation of the country is very severe with regards to the oppression of state power. These are political problems. 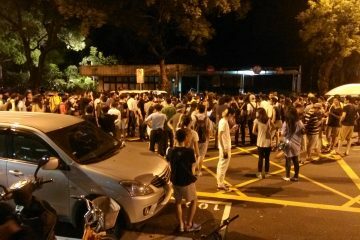 Since Taiwan is a country that holds elections, the citizens can remove the bad people from office. Therefore, we feel that the way to resolve these problems is through election and participating in the legislature. EL: Why is that out of Taiwan’s Citizen Union there also appeared another third party, the Social Democratic Party? QXZ: The main thing is that while we were forming Taiwan’s Citizen Union, I was working on too many pro bono legal cases, I didn’t go to the meetings. 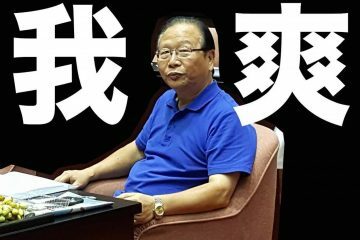 In the end because the New Power Party had many lawyers I was familiar with, such as the Judicial Reform Foundation’s Lin Fengzheng, I stayed in the New Power Party. Of course, my ideals are also closer to the New Power Party, such as the principles of transparency. The New Power Party online selection of candidates process is very creative; it lets people and netizens get together to vote online and nominate their candidates. This is an open and transparent way which fits with what I believe. I believe that having an open and transparent legislature can prevent backroom deals and compel legislators to be accountable to the people. The New Power Party’s ideals are similar to mine, as we want to pursue the ideals of a new legislature. 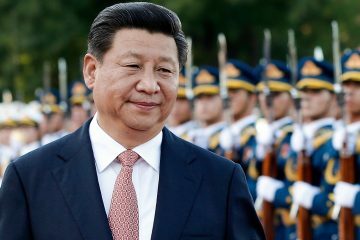 Of course, like the Social Democratic Party’s Miao Poya, we have friends and comrades in common from the Zheng Xingze case. My relation with the Social Democratic Party is very good and I also have good friends in the Social Democratic Party. EL: Do you agree with the description of the Social Democratic Party as “flanking” the Democratic Progressive Party? QXZ: I don’t agree, we and DPP minority whip Ker are competing for the same constituency in Hsinchu, but we stand up for ourselves. We believe that this election should be done procedurally, and we oppose Legislative Yuan president Wang Jin-pyng and the DPP’s minority whip Ker establishing together a culture of secretive negotiation within the Legislative Yuan. We don’t stand for this sort of a black box culture, and this is an important obstacle to progress. Of course, we also believe confidently that we can attract the public support of the younger generation with our beliefs. Any countries legislative procedural should not head towards a blackbox negotiation culture. There are many shortcomings to the culture of backroom negotiations, in which this becomes a process of a first reading, then a second reading, then a third reading. In general, important political issues should be decided by the legislature, and this is the reason why in past constitutional design, there are so-called fundamental principles of the legislature. That is to say, the legislature puts forth more programs than the Executive Yuan and important matters are given to the legislature to decide. We need to understand why the legislature has become the place where the most important political decisions have been made. In the constitution, there have been strict specifications to regarding the importance of the political organs of Taiwan. In the past, Legislative Yuan President Wang Jin-pyng, and DPP minority whip Ker Chien-Ming have used inter-party consultation, so that in the second reading, legislators cannot put forward their opinions. This is a severe problem. Closed door backroom dealing empties out the specification of dealings, with the justification that the “legislature is the legislature”, but then why are important political decisions made in legislature? This chaos within legislature most definitely needs reform, and there is resolve to do so because the New Power Party of course has to become something other than a flank party, although we have very different political values among our candidates. EL: After you raised the issue of legislative reform, other political candidates and politicians would believe that you raise this out of your own political interests because you’re running against Ker Chien-Ming? Moreover, there are those who believe that is because you are competing against Ker Chien-Ming, the NPP may split up votes between the DPP, and in the end, the KMT would ultimately come out on top? How would you respond to critics? QXZ: In truth, that’s not it. During nine-in-one elections, county candidate Tsai Jen-Chien, Lin Zhijian and Xu Ming-Choi, were competitors. 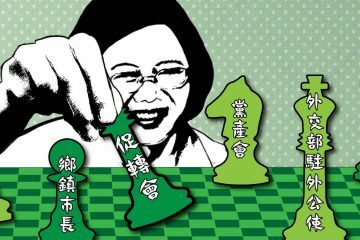 At the time Tsai Jen-Chien was a DPP mayor, but in the end if selected as DPP mayor, the gaps between the candidates was not large. This represents that Hsinchu city already gotten beyond the division between blue and green. Why was it like this? Because with Tsinghua University, National Chiao Tung University, and the Science Park, there are a lot of young people in Hsingchu. There are many young voters or young parents like me who have their own political views and beliefs and support our direction of reform. We’ve worked hard these few months and our approval rating continues to rise, from starting off with 4% to getting close to 20%. There’s isn’t much difference from the approval rating of Ker Chien-Ming. But I feel that this election is a competition between myself and myself, and the other important competitor is the KMT political candidate, because beating the KMT is the only way to get voted in. The legislative reform policies we put forth and the things we’ve done in the past stand together with the people, we will definitely continue to work hard to earn the approval of the people of Hsinchu. 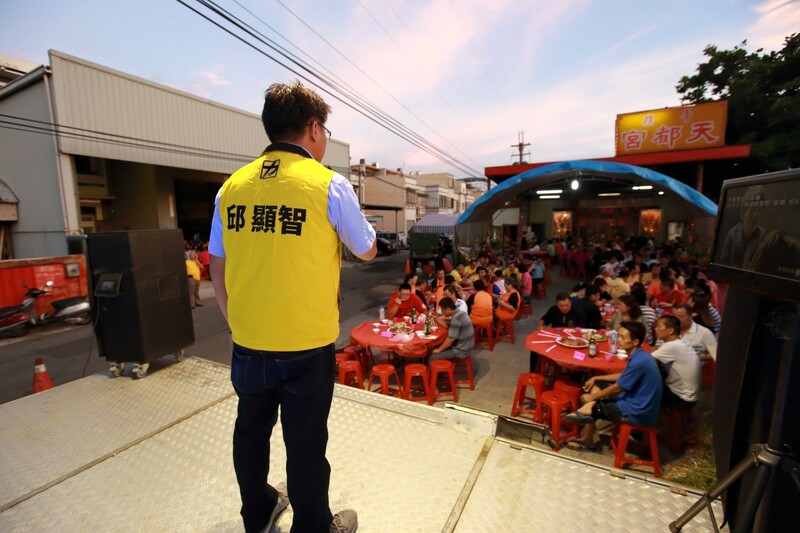 In the future, we have faith that we will be voted in, we believe that our open popularity will let more people to come to know us and we have the opportunity to be voted in rather that the KMT political candidate gets elected, we have faith that the people of Hsinchu will come to identify with us. EL: So you’ve never considered merging with the DPP? QXZ: Up to now, nobody has discussed this question, but overall, minority whip Ker represents the old backdoor politics, and what we need is new politics in the legislature. This differs from Ker’s ideals, so it would be difficult to merge with the DPP. Our way of thinking is very simple, just that we need an open and transparent legislature. Of course, maybe there is a need for Ker to advocate the old form of backdoor politics, but between us and Ker, it should the people who decides who is right. EL: Why did you decide to run for legislator in Hsinchu? QXZ: To begin with, after I returned to Taiwan from Germany in 2010, I always lived in Hsinchu. My wife works here, my children grew up here. The oldest is in kindergarten right now, and her younger sister is being taken care of by a nurse, so there’s not any special reason. I just feel Hsinchu is a place I know, it’s where I live and breathe. For five years, I was in Heidelberg, it’s a small city much like Hsinchu, with famous schools, an industrial park, and similar industries. In my heart there is a wonderful vision of Hsinchu, I feel Hsinchu is place that can move forward. On the other hand, Hsinchu also has an old city, there is past and present here, and mountains and sea. Because after I returned to Taiwan, I’ve been with my wife here, I have a deep feeling towards this city. EL: So you believe that after the people of Hsinchu come to know you, they will support you? QXZ: Yes. Apart from legislative reform as a national level idea, we have many plans and ideas for Hsinchu, such as public care policies, because Hsinchu is the city in Taiwan with the highest birthrate. For example, I have a two year old daughter and a four year old daughter. There are a lot of young fathers like me, parents who work in the industrial park, and double income families whose kids have to be properly taken care of. This is the problem of public care. To lessen the burden of young parents, this is an important issue of Hsinchu. The second is problems of justice for residents. Young people can’t afford housing, regardless of whether they are married or have any kids, so what kind of future is this for Taiwan? Housing is an important question. We believe that housing is the right of residents and not a commodity to be bought or sold. This is what we push for in regards to justice for residents. Why should residents of Hsinchu pick us? I truly believe that the most important reason is we’re not just running for legislator only as our only aim, but we also hope more broadly to change the country from the Legislative Yuan, and we hope for an open and transparent legislature. To let the Legislative Yuan to truly serve its role, to achieve the expression of the will of the people, and not to be dominated by senior politicians. As for policies regarding Hsinchu, we feel that residents of Hsinchu face these problems together. Like us new fathers, or newlyweds who are isolated and taking care of children. Right now my wife and I are working, we still rely on rent to live, we are suffering, and we understand what regular people go through, and are willing together with everybody to confront these problems and resolve them. EL: Many political candidates like to talk about the feelings of the people, can you elaborate a bit more? QXZ: Let’s put it this way. When I was in Taiwan, I frequently went to funeral shrines. Hsinchu’s funeral shrines usually don’t have a lot of people. People from funeral companies will tell me, you don’t have to go anywhere, this is a place full of old veterans, these are people who die are so alone in the world. When I heard this, I started to go there to pray. It’s quite ironic that these people die with honors, but were military veterans that came with the KMT here and then were forgotten by society over time. When I go to military communities, veterans tell me that many people were forced to come to Taiwan. Concerning such past incidents, there are many underprivileged veterans who were exploited and bullied by the government. From when they were young, they were with the KMT government, but are very dissatisfied with the KMT government in the present about issues such as compensation for dependents, including cases like in Taipei’s Huaguang Community. Entering military communities and talking with old veterans, actually national consciousness is not the same, but I find there are many points of agreement with them. Interviewing military community headmen, these people identify with us. When there are underprivileged in society, we are happy to help. In the past, I was a lawyer at the Lishan Farmer Self-Help Organization. Lishan was an important model village during the period of KMT martial law, they opened the the Central Cross-Island Highway, so they would give them fruits and vegetables, and technical guidance regarding the land. But many years later, the Forest Service turned around and sued them. These are the kinds of people I am talking about. In the past, I went with the village head and drove seven hours deep into the mountain. In the darkness, it was an old person talking, with an accent I didn’t quite understand. After visiting old veterans like that, outside waiting for me were three Atayal aborigines, they told me: “You must help these old veterans, they are really suffering.” Their homes were 2,000 meters on the mountain, have been demolished one by one. When I saw the Forest Service was going to demolish houses, they were clinging to the pillars crying. On the altitude of 2,000 meters up, discussing the events, I felt very bitter and sad, seeing the real marginalized of society had been displaced from care. So I truly am concerned with taking care of the marginalized of society. In Hsinchu, we don’t divide by race or ethnicity, we have just want to take care of Hsinchu. EL: Why did you decide to appoint Chen Wei-Ting as head of your election team? QXZ: It’s been for a long time that we had a partner relation. In regards to the Sunflower Movement, and events in Miaoli, I was always Chen Wei-Ting’s lawyer and he was my client. I learned a lot I hadn’t before from the student movement. Fundamentally I was a lawyer, and paid more attention to legal matters, towards political matters I was less familiar. Chen Wei-Ting from the anti-media monopoly movement has unceasingly paid attention to Taiwanese political matters, so I learned from him and other students. 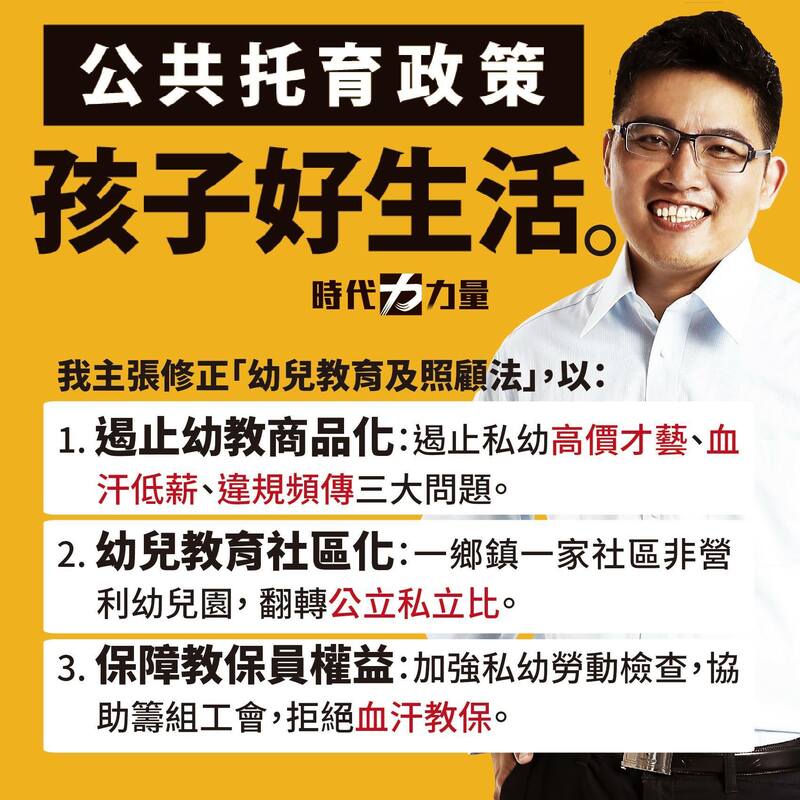 EL: But Chen Wei-Ting is a controversial figure in Taiwanese society, do you feel this will add to or detract from you campaign? QXZ: It’s worth saying, we sincerely contribute to this society. Looking at it from this perspective, Chen Wei-Ting undoubtably contribute to society selflessly, without complains or regrets. For a long time, I was his lawyer, looking at his efforts for society, it’s like Shakespeare’s King Lear. His first daughter and second daughter say they love their father, but the third daughter uses actions to express her love. With words it’s not stated, but we know this. When I look at people sincerely willing to sacrifice for society, of course it’s their actions you look at. In regards to Chen Wei-Ting, personally I see his past doings and feel very moved. Because as his long-time legal council, we have become very familiar with each other. Before deciding to run, I asked the advice of many students. A lot of people are hypocritical towards you, aren’t very sincere towards you, but I know that these twenty-something students will tell you the truth, and students opinions are for me an important deciding factor. I think that Wei-Ting is willing to sacrifice for society and doesn’t need to take on so much responsibility, for example, looking after the Chang pharmacy widow. We are looking for people wishing for the good of society in this campaign, so we found Chen Wei-Ting and Wei Yang. I myself fundamentally feel from their actions that we can see their sincerity towards society, but this also needs their willingness, if they are willing to fight alongside us. Chen Wei-Ting refused many times, saying he needed to finish his studies, so I went to him again and again asking him because I feel people truly wishing for the good of society are very few, but the important thing is the values motivating them. When I helped Wei-Ting with his defense, I could see this. He is desperate to help society, and for this he is very brave. In the past, everyone felt that Chen Wei-Ting is very impulsive and radical, but I don’t believe this. From his writings on Facebook, I understand the thought processes of this young person, and that he has scrutinized his words before spilling it. I feel his words are very logical, so I believe he can contribute a lot to my campaign.